Our Passion ... is to help organization achieve effective relationships with both internal and external stakeholders, so that mutually desired behaviors result. are sure to create solutions that meet their objectives and that fit their organization's culture. better design programs that will motivate or change behavior. 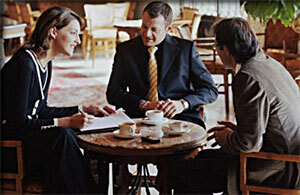 Confidentiality of Our Client Base: We often deal with an organization's critical issues. clients or share specific information about projects we have done without client permission. "muscle" to stand on their own.